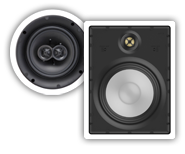 Multiple designs and sizes ensure you’ll find a speaker that’s a perfect fit for your home theater or stereo application. Great sounding speakers that disappear into your room’s décor. For home theater and multi-room audio. Take great sound to the great outdoors with our completely weatherproof outdoor speakers. Dramatically improve the impact and emotion of what you hear. Prepare to be immersed. Use as your primary stereo system. Think of this solution as a "smart speaker" on steroids. You get a more powerful amplifier, your choice of quality speakers that you can spread apart for better coverage and stereo imaging, and an option to add a source in addition to whatever the Dot has to offer. Use as the perfect stereo for your teenager. Most teens want something that performs more like a real stereo system than a plastic stand-alone “smart speaker”. In addition to the Dot, let them add whatever second source they’d like (phone, music streamer, game system, TV, etc.). And why is this the perfect solution for you as well? Because you can always interrupt what they are listening to by “intercoming” into the room with Alexa’s “drop-in” feature. No more shouting to get their attention! Stream the same source, in sync, into multiple smart stereo kits. Use the Alexa app to stream the same source through all of your Dots. Through the Alexa app you can group multiple Dots together to play all of them in sync. FAQ - Can I create my own Just Add Dot system using In-Wall or In-Ceiling speakers? If you are able to run speaker cables behind your walls and ceiling, you can absolutely create a Just Add Dot smart stereo using in-ceiling and in-wall speakers! In fact, you can install multiple JAD smart stereos throughout your home to create a simple whole-house system that provides unique listening within separate zones, with the ability to combine all zones together for “party mode”. We call this type of installation <="" a="">Hybrid Wireless. With access to your walls and ceiling, we provide a clever mounting kit to hide your Voice Assistant in the ceiling. FAQ - Can I use a Google Home Mini instead of the Amazon Echo Dot as my primary source? Yes and No. Unlike the Dot, the Google Home Mini does not include an audio output. You can pair the Home Mini with a Chromecast Audio and then connect the Chromecast Audio’s audio output into input 1 on the SZA-2A. In this way, you can issue a “Hey Google” command to the Home Mini to stream music out of the Chromecast Audio. However, if you ask a simple question like “Hey Google, what’s the weather forecast?”, the answer will come out of the Home Mini, not the Chromecast Audio. Maybe at some point in the future Google will provide a software option to fix this, but until then we will continue to recommend the Dot. FAQ - If I hide my SZA-2A in a closet or behind a TV, how would I turn it on and off? In addition to auto-source switching, the SZA-2A also includes an auto-on feature. Use this option to “set and forget” the amplifier. When no source signal is detected from either source input, the amp will go into sleep mode drawing minimal power. When either source is detected, the amp will automatically power up and start playing that source. For more details and suggestions visit the SZA-2A page.